You have seen the Proactiv commercials dozens of times on television. You have heard the testimonials and seen the Celebrity faces promote it. I am sure you have wondered...How much does it cost? Does it REALLY work? My skin has never been really bad, but I always have some acne. I get random pimples to pop up on my forehead, cheeks, and hair line area. I also have really yucky blackheads on my nose. Well, I recently got a chance to try Proactiv for myself and I was pleasantly surprised about several things. First of all, the price. Did you know that you can buy a 3 step system for only $19.95 a month! That is a few stops at Starbucks or McDonald's. You can get their deluxe system for $29.95 a month. I always thought that Proactiv was probably overpriced, but I never took the time to find out. Now I wish I had. I was sent the 3 step system plus the Refining Mask and a Green Tea Moisturizer. I had a few worries when it came to the 3 step system. 1: Would step 3 which is a lotion leave my skin feeling greasy? 2: Would I be able to remember to use Proactiv twice daily? 3: If I forget a treatment, will I break out? You will be happy to hear that my worries were all pointless. The lotion did not bother my skin or feel greasy. while I did forget to do it occasionally, I managed to do at least once a day. If I did forget, my face did not turn into a big pimple. Yay! I really love the cleanser and the toner! They have a nice flowery scent and make my face feel incredible. You wash your face with the cleanser and then dry and apply the toner. Then, let the toner dry and apply the lotion. I applied the lotion thinly with a cotton beauty pad. The whole process only takes about 5 minutes. 10 minutes a day to clear skin. Wow. 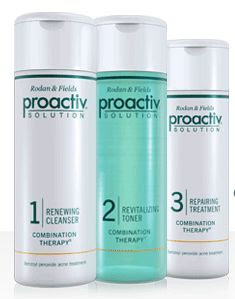 I have been using Proactiv for 2 weeks now and it has greatly improved my skin. I have not had any breakouts or pimples and my blackheads are less noticeable. They are finally shrinking! I recommend that you try Proactiv. They also have a 60 day money back guarantee. So, what do you have to lose? Disclaimer: I received a sample to do this review. I did not receive any other compensation. The views stated here are my own honest opinions.